Evangelos Marinakis, the owner of Olympiacos FC and a leading Greek ship owner, has received a special honour recognizing his contribution to the commemoration of the Pontus Genocide. 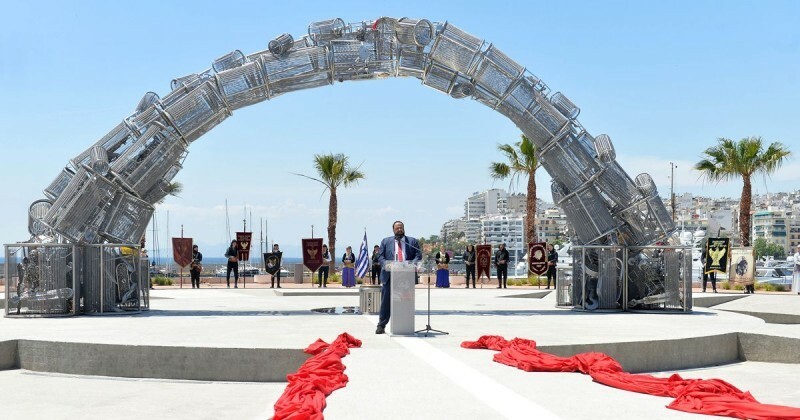 Among other forms of support, Mr Marinakis funded the design and construction of a new Monument to the Genocide of the Greeks of Pontus, which was unveiled in May in Piraeus’ Alexandras Square. The genocide of the Greeks of Pontus is a lesser known atrocity carried out by the Turkish government between 1915 and 1926 in which an estimated 353,000 Greeks of Pontus were killed. The award was bestowed upon Mr Marinakis at the 13th Pan-Hellenic Festival of Pontian Greek Dances, an event honouring Pontic Hellenism held at the Peace and Friendship Stadium in Piraeus on December 2nd. The festival is organised by the Pan-Pontian Federation of Greece and the Association of Pontian Organisations of Southern Greece. The celebration was attended by 453 associations, and 2,500 hundred dancers and dozens of artists participated. The festival began with a theatrical performance in the Pontian dialect followed by a tribute to the famous Ypsilantis family, to whom the event was dedicated. At the event, Mr. Marinakis was awarded a special honorary plaque which commemorates his support for Pontic Hellenism. Mr Marinakis is a descendant, on his mother’s side, of the prominent Ypsilantis family, whose ancestors played a central role in the 1821 war of Greek liberation. Outwardly, it resembles a huge wave that rises from one homeland, from Pontus, to the other, with everything, memories, traditions, imprints of the ancient presence of the Greeks in Pontus. Inside, the work is adorned with 17 sculptural compositions, successive icons depicting the flight of a “refugee bird” fleeing from Pontus to reach an unprepared homeland that sheltered the refugees’ dreams. I am honoured to receive this award. The tragedy of the Pontus genocide should never be forgotten and therefore, as time passes, it is ever more important to remember our history and the lessons that we can learn from it. It is especially poignant for me because I am a descendant of the Ypsilantis family. For that reason, it is my privilege to be able to contribute to the preservation of that memory, both through the Monument, and in any other way that I am able to. I wish to thank the Pan-Pontian Federation of Greece for its extraordinary work, which does so much to keep alive our traditions and history. It is a great joy and honour for the Municipality of Piraeus to host the 13th Festival at the Peace and Friendship Stadium. We must preserve forever the memory of the Genocide and honour the Pontian refugees. Many refugees landed in Piraeus, were assimilated in our society, and with their industriousness and ideas became permanent residents of the city, transferring traditions and new cultural elements to the local society. Pontian Hellenism is a significant segment of our population and we honour it. We honour this port, this city, and the people of Piraeus, because it was the only municipality in Greece that responded positively to our Federations' request to erect a Genocide Monument. Thus, on 21 may, 2017, we were happy to be present and participate in the unveiling of this grand monument to the Genocide of the Pontian Greeks, in Alexandras Square.